Here’s why I love it so much. I love quality saisons, and I love sour beers. 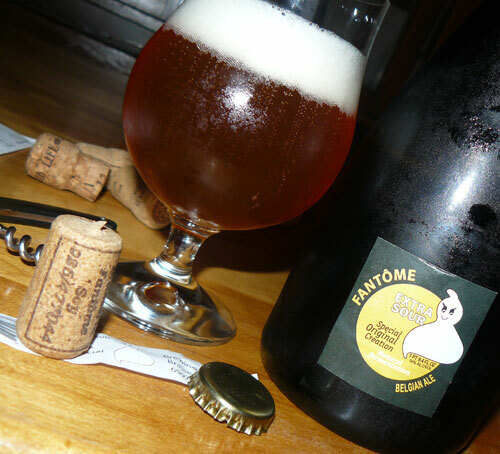 And Fantôme Extra Sour is one of best saisons and one of the best sours I’ve ever tasted. Fantôme Brewery is a small specialty brewer located in the small town of Soy, Wallonia, Belgium, that produces only saisons. The Fantôme brewing facility is so small that it can only produce tiny batches of beer, and as such, its saisons, especially it’s “Special Creations,” or limited production can be difficult to find and very expensive. The packaging is simple yet elegant with just two small labels at the bottle’s base and a thin-paper ribbon over the bottle cap. To open the dark-green bottle you first must remove the paper, pop a bottle cap and then pull the cork using a tradition wine corkscrew, which is the case with all Fantôme’s “bomber” bottles. I poured the golden-honey potion into a large tulip glass and it settled nicely with a frothy cuttlebone-colored head. You can smell the sweet-sour tang as soon as you put your nose close to the brew, along with the funky Belgian yeast. Fantôme Extra Sour taste like a smooth, fresh saison at first but it finishes with a mouth-puckering-but not-too-acidic sour bang. It’s a big beer with a 10% ABV, and the sour funkiness mostly kills the alcohol taste. But it does leave a mild burn and you feel it after a few large sips. Of my favorite sour styles is the barrel-aged Flanders red ale, and though Fantôme Extra Sour is very different than the popular Flanders ales such as Rodenbach, it has a similar barrel-tang that really combines nicely with the saison style. Fantôme’s Extra Sour “Speciale” is the second is limited series of Special Creations from the brewery, and as mentioned above, it’s extremely rare and expensive. My “bomber” bottle (1 pint, 9.4 fluid ounces) cost $32. As much as I love saison, that’s a lot of money for beer. If you see a Fantôme Extra Sour for sale, I recommend purchasing it and saving it for a special occasion. Good luck finding it, though. That bottle is a 750ml release, not a bomber. This release was only 580 bottles and it seems highly unlikely your reader base will stumble across this beer in a store when most locations got a single case and sold out immediately. You’re correct, I used the wrong terminology when referring to the bottle as a bomber. A bomber is technically a 22oz. bottle, but I usually just call the larger, “multi-serving” bottles bombers. I did, however, note that the bottle was a 1 pint, 9.4 fluid ounce bottle, so my mistake shouldn’t have been misleading. I know the beer is rare; that’s why I reviewed it. I prefer reviewing and featuring rare beers, because those are the beers I like to see reviewed, not just the beers I can walk into my local liquor store every day and taste for myself. Where’s the value in that? 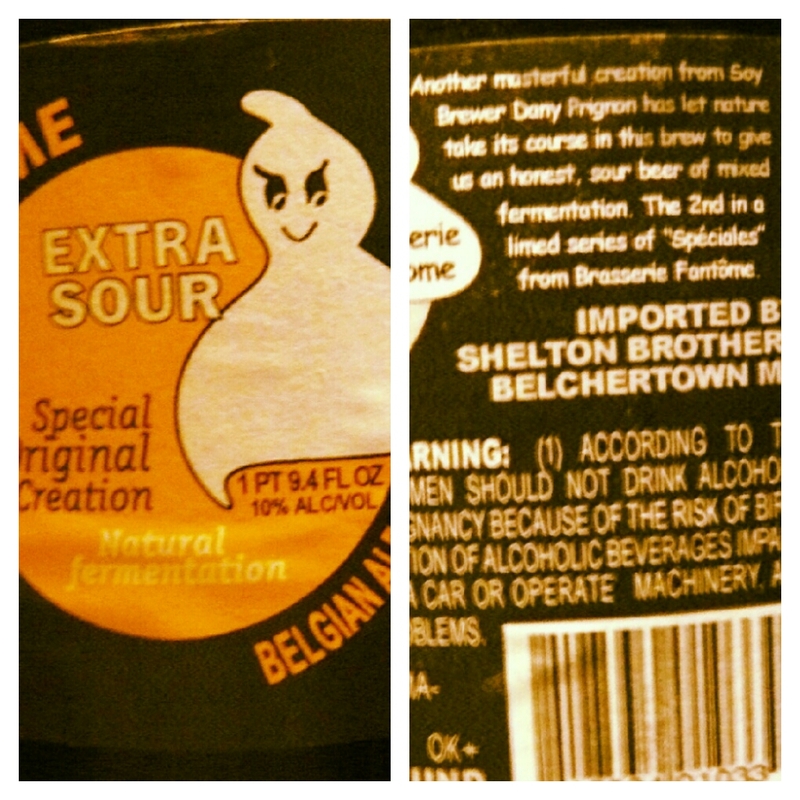 Also, I was able to find two Extra Sour bottles at two different stores in the Boston area. If I could find them, my readers can too.